There are a great number of mixed signals on the direction for Bitcoin when using Financial Astrology and Gann Analysis. To me, the greatest near-term threat is the very steep downtrend line Gann’s Square of a Range – that’s something that I will discuss in this article. 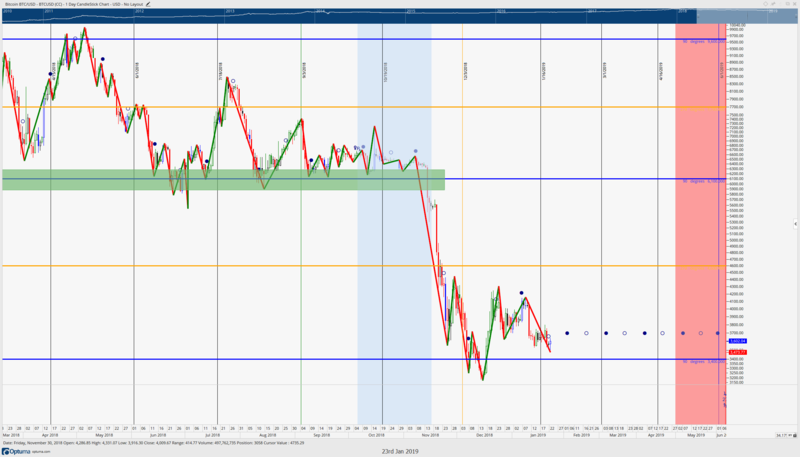 While support is currently limited, any move above these key zones would provide exceptional support zones in the future. 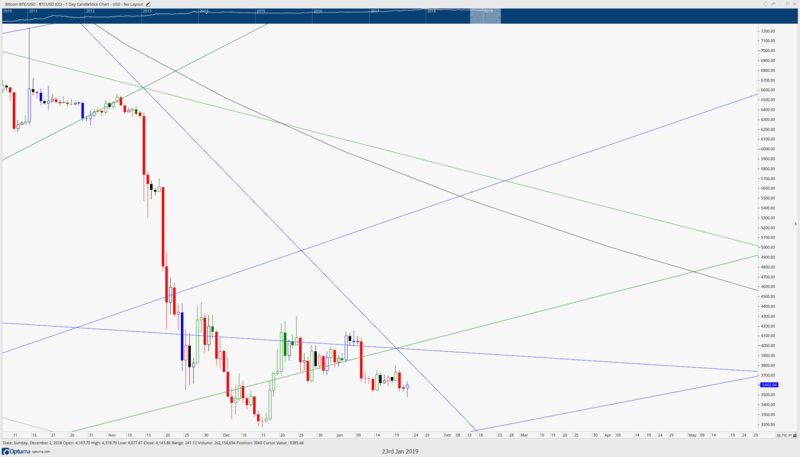 The Gann Planetary Line of Jupiter is a very strong zone of support and resistance for Bitcoin. Probably one of the clearest examples and pieces of evidence for this is massive drop below that line back on November 14th, 2019. That drop represented generated the biggest and most painful move down for all of 2018. But where did price find some support? Near the next harmonic level below. However, Bitcoin is currently trading below that level – but it is not suffering a total thrust down either. We are still within the responsive time to see a reaction to the conjunction between Pluto and the Sun that occurred on January 13th, 2019. Prices have historically responded very bullishly after this aspect. Historically, the strongest areas of support and resistance found on the Square of 9 charts for Bitcoin have been the 90 and 270-degree angles. The 90-degree Square of 9 angle at 6100 held for nearly all of 2018 as the major Square of 9 support zone. Price fell through that zone, then very swiftly through the next 270-degree Square of 9 support level at 4600 before ultimately driving even further down to the current support 90-degree Square of 9 angle at 3400. It remains to be seen how price will react to this zone, we could get another example of a strong sell-off below the current 90 -degree angle. If that were to happen, then a similar drive through the next 270-degree angle would bring us all the way to the next 90-degree angle at 1500. If we follow Gann’s Rule of all Angles, then the next price level for Bitcoin to test is the 3100-value area. But bears would first need to see if the current trading range is going to hold before breaking lower. The green diagonal line is the 45-degree angle in Gann’s Square of a Range. This 45-degree angle should be viewed as a major indication of a new bull market if price can cross back above that angle, which now sits at 4018. However, every day that we move and consolidate, the faster the 45-degree angle moves away from price. Traders would need to see a significant number of buyers to step in and move prices higher against this current down drive. But we should also observe how close price is to downtrend line right in front of the current day’s price action. 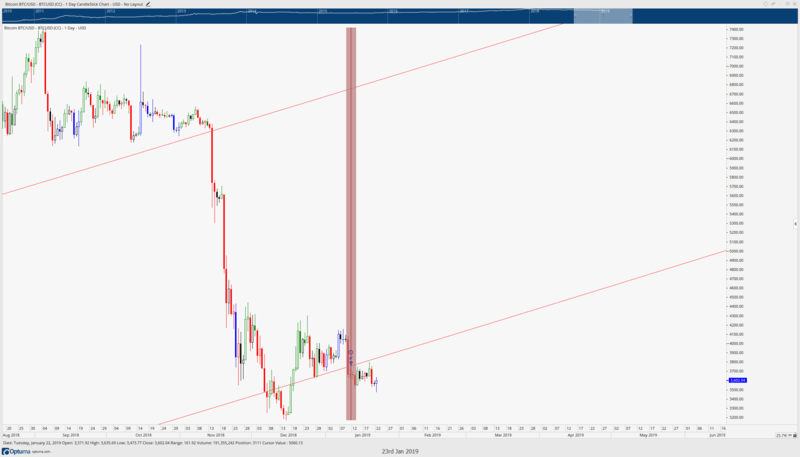 That trend line is the extreme downtrend line within this current Square of a Range. If price moves above that line either in time or price, a near term threat of swift movement lower would be avoided. But we will have to see how prices respond to that angle over the remainder of the week as the next time we see Bitcoin intercept that angle is on the 31st of January 2019.